Full figure unicorn standing with head turned, looking over his proper left shoulder. His tail is curved upward in an ""S"" form. There is a lily in its mouth with the blossom on the proper right. 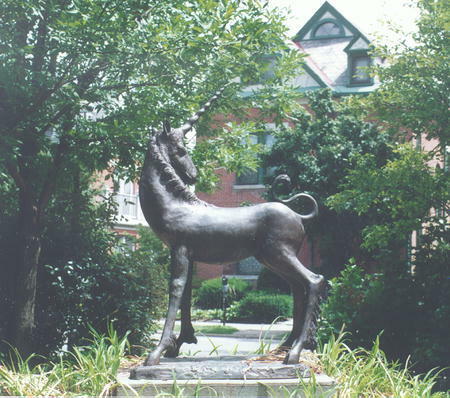 : Jack Greaves, “The Unicorn in the Garden,” Ohio Outdoor Sculpture Inventory, accessed April 22, 2019, http://oosi.sculpturecenter.org/items/show/677.